Purple Milkweed (Asclepias purpurascens) in the “pollinator garden” planters at the entrance to Tarleton Park in the City of Alexandria, VA. This species, historically known in Alexandria was reintroduced to its original habitat and general location in the City from locally sourced and propagated stock. Photo by Sue Dingwell. Green Milkweed (Asclepias viridiflora) naturally-occurring in the rugged, dry, sandy, gravelly native meadow at Hammond School in the City of Alexandria, VA. Photo by R.H. Simmons. 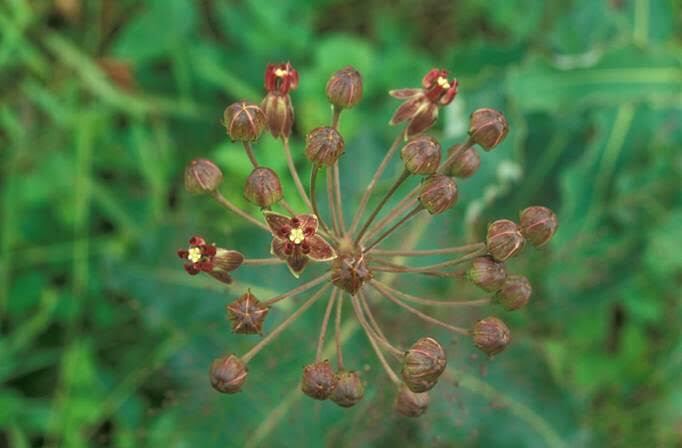 A native plant is one that occurs locally and naturally – without direct or indirect human intervention. Planting “native” plants outside their range or habitat into natural areas is a significant form of domino-effect degradation. Such practices are decidedly outside the principles of ecological restoration. Limit soil and land disturbance as much as possible – to prevent weeds and invasives and to minimize the footprint of artificial landscapes. The eastern U.S. is dominated by the Eastern Deciduous Forest and its diversity of forest communities. Consequently, it’s no surprise that most lepidopterans found in the east are dependent on the natural diversity of broadleaf woody species for the larval stage of their life cycles. Adults nectar on the flowers of a myriad of tree, shrub, and wildflower species within this mosaic, but need forested areas to survive in perpetuity. 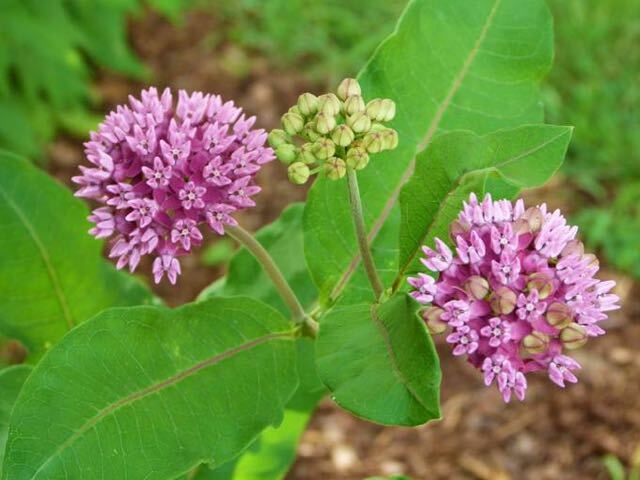 It is important to realize that we are not the midwest, prairie, or western states, or even historically a major “stronghold” of Monarchs for instance – and that the aim of pollinator gardens and such plantings should not be largely hosting just two species – Monarchs and milkweeds – as they are becoming with many well-intentioned school educational gardens, etc. 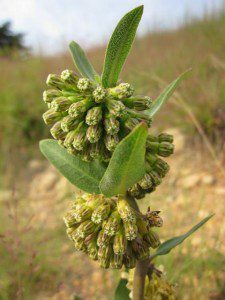 We certainly don’t want to disproportionately – or unnaturally – produce plantings of milkweeds at the expense of the natural diversity of companion/associated plants that still exists in most areas. Doing so might cause situations where native plants become invasive in certain areas to the detriment of existing flora and wildlife that depend on those other plants for survival. As always, look to the natural landscape, site conditions, and flora nearest and most representative of a desired planting site and use those elements as the template or foundation for the plantings. Clasping Milkweed (Asclepias amplexicaulis) atop the steep, sandy-gravelly bank along Shirley Highway (395) near Landmark (old Lincolnia) in the City of Alexandria, VA. This population – Alexandria’s only known occurrence of this species – was recently destroyed for the construction of sound barrier walls and highway expansion near Landmark Mews necessitated by the massive BRAC development at Mark Center. Photo by R.H. Simmons. There is a diversity and abundance of flowering native plant material in and around urbanized areas for pollinators! We need to always ensure that conservation and quality stewardship of natural areas be the main priority, with quality native plant pollinator gardens and plantings an important supplement. Rod’s message is one that needs to be repeated as a litany, daily, with enthusiasm and as he has done, based on sound facts. Homogenenous ecosystems give no sense of space for humans nor native biodiversity to support all life. Never tire repeating this essential message. Life depends on it. Thanks Rod for sharing it and Sue for posting it on the VNPS Blog. Now, out to remove the latest two butterfly bush remnants of a house warming gift 9 years ago and removed 7 years ago. After deadheading two years, plants were appearing far from the original. Insidiuous invader, choosing thin rocky soil in full sun and at woods edge with sun/shade on these two latest invasions. And, I know of no person who uses and advocates ONLY using native plants in garden or landscape. I planted free blooming ‘eye candy’ Gumpo Japanese (Rhododendron x Satsuki “Gumpo White’) azaleas that are never visited by pollinators and that deer do not nibble. These low mounding shrubs will always be part of my next-to-the-house landscape, along with my Common milkweed (Asclepias syriaca) by my porch. They share a bed. When the milkweed overpowers the azaleas, I dig and share it with neighbors and some goes to my meadow. No introduction of non-native or native plants into my natural woodland in my plans. Only the removal of microstegium. Seeds of Japanese stiltgrass has washed from the land above to ruin the orchid’s home in the dell. Rod and Sue, thank you, again. Never give up protecting the natural habitats of our native plants. Nicky, thanks for your thoughtful comment and encouragement, not to mention all you have done to protect our native ecosystems and share your knowledge of them with others.